The self-sufficiency and regional outlook of farm life characterized the United States until the Civil War period. With the triumph of the industrial North over the rural South, the expansion of urbanism, and the closing of the frontier, the agrarian sector became an economic and cultural minority. The social benefits of rural life - a sense of independence, commitment to democracy, an abundance of children, stable community life - were threatened. This volume examines the rise of a distinctive agrarian intellectual movement to combat these trends. 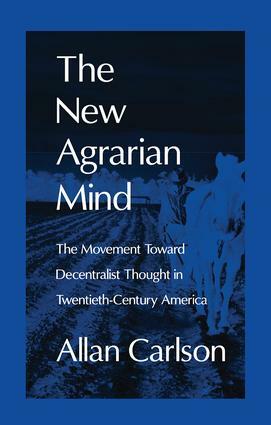 The New Agrarian Mind, now in paperback, synthesizes the thought of twentieth-century agrarian writers. It weaves together discussions of major representative figures, such as Liberty Hyde Bailey, Carle Zimmerman, and Wendell Berry, with myth-shattering analyses of the movement's cultural diversity, intellectual influence, and ideological complexity. Collectively labeled the New Agrarians to distinguish them from the simpler Jeffersonianism of the nineteenth century, they shared a coherent set of goals that were at once socially conservative and economically radical.